Kate and Letizia waved us off on our long holiday, and they're here to welcome us back with open arms. And open sleeves. Thanks for keeping it interesting while we were away, ladies. The Duchess of Cambridge attended day 1 of Wimbledon. 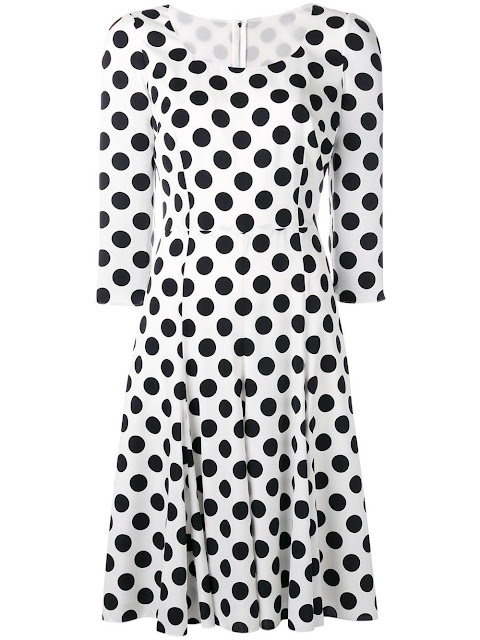 Man oh man do I love a polka dot dress. And proper sandals. And legit handbags, of the sort that could actually carry a thing or two. And shades! There was a also a haircut, of the sort that seemed to be breaking news for some but which had to be pointed out to me. I give it two shrugs. Anyway, who's got time for hair trims when there are polka dots to be considered, eh? Queen Letizia attended a Foundation Against Drugs meeting. We've seen this top before; Crown Princess Victoria paired it with a pencil skirt. We've seen these sleeves before; Queen Letizia does love her trends. But it wasn't until someone made a total matching outfit out of it that I realized the full Blanche Devereaux potential. We're talking prime Golden Girls 2017 material here. I can see her swooping out to the lanai already.